The Piatti Quartet are one of the most distinguished quartets of their generation. Prizewinners at the 2015 Wigmore Hall International String Quartet Competition (formerly London), they have performed in all the major venues and festivals around the country as well as concerts throughout the world. Please go to our diary page where you will find out more about our upcoming performances, exciting world premieres, and collaborations with some of the world’s finest musicians. The Piattis are renowned for their diversity, commitment and passionate interpretations across the spectrum of quartet writing. World premieres are regularly performed alongside old masterpieces and the Piattis are particularly known for expanding the quartet genre through their collaborations with leading British composers. Current commissions and premieres include new works by Mark-Anthony Turnage, Darren Bloom, Emily Howard (The Music of Proof with celebrated mathematician Marcus du Sautoy), Simon Holt, Freya Waley-Cohen and Jacques Cohen. The quartet have collaborated with artists such as Ian Bostridge, Michael Collins, Krzysztof Chorzelski, Julius Drake, Charles Owen and Guy Johnston. The Quartet previously commissioned Joseph Phibbs’ String Quartet No.1 and a recently released disc for the Champs Hill label features this work alongside the premiere recording of Turnage’s Twisted Blues with Twisted Ballad, with classics by Britten and Bridge. The Quartet’s other recordings have been released on the Linn Records, NMC and Champs Hill labels, including the Piatti’s lauded contribution to the complete string quartet works of Felix Mendelssohn (Champs Hill), which was BBC Music Magazine’s Critic’s Choice (September 2014). Most recently, the Quartet was featured on a jazz concept album released by 33 Records and critical acclaim for this recording has included a 4.5* review from Downbeat Magazine. Recent seasons have included debuts in Rotterdam, Istanbul, and Barcelona, and upcoming concerts include a debut at the Aldeburgh Festival, a Wigmore Hall world-premiere concert and further performances around Europe. At the 2015 Wigmore Hall International String Quartet Competition, the Piatti Quartet won joint 2nd Prize as well as the St.Lawrence SQ prize and the Sidney Griller Award for the best performance of Mark-Anthony Turnage’s Contusion. The Piatti Quartet were the Richard Carne Junior Fellows in String Quartet at Trinity Laban Conservatoire of Music and Dance from 2014-16; previously they spent two years as Leverhulme Fellows at the Royal Academy of Music. 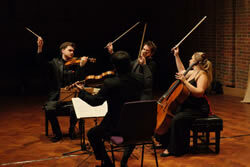 The Quartet is currently mentored by the Belcea Quartet through the Belcea Quartet Trust and the quartet would like to thank the Britten Pears Foundation, the Ralph Vaughan Williams Trust, the Hattori Foundation, the Razumovsky Trust, the CAVATINA Chamber Music Trust, and the Fidelio Trust for all their continued support.